Here is my graph, which I created using Matthias Melcher’s Think Tool – Thought Condensr, which is very quick and easy to use. Like Matthias, I puzzled over why Stephen required that the graph – “should not contain a self-referential node titled ‘me’ or ‘self’ or anything similar”. How could I avoid this if the graph is to be about my identity? 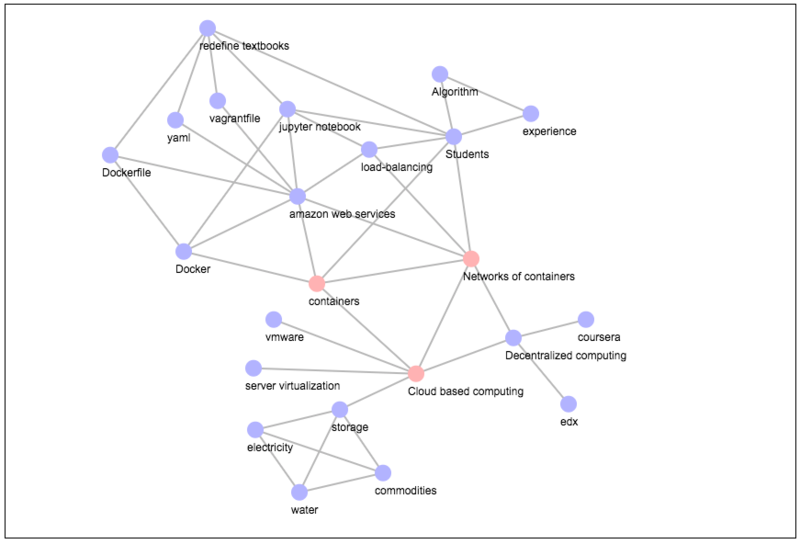 In the event, it became obvious that not only is it possible to create the graph without referring to me, but also that doing this clearly demonstrates that knowledge of my identity is in the network rather than any specific node. My identity begins to emerge from the graph, without me having to specify it. You can see from the graph that there are three links which don’t connect. I did this by simply cutting them off for the screenshot of the graph, because I wanted to suggest that this graph could, in fact, go on and on. This image provides only a glimpse of my identity. 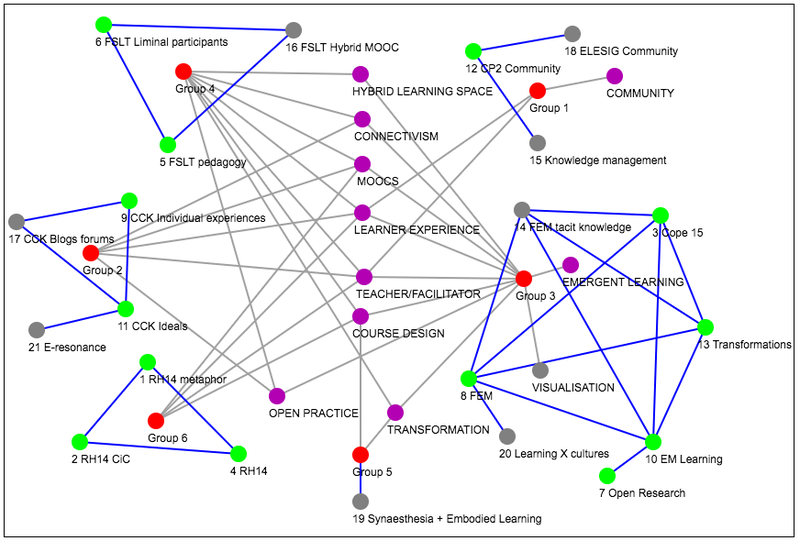 I could not only expand the graph, by making more links and connections, but I could also make more connections within this section of the graph. I am also aware that if I started afresh and drew this tomorrow it would be different because my identity and how I think of it is fluid and evolving. I was also aware in drawing the graph that pretty much all of it is traceable online. 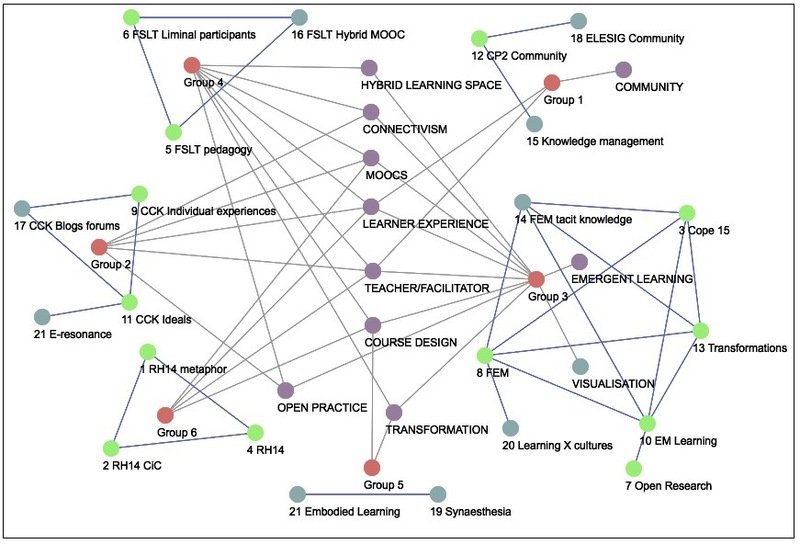 It reminded me of the introductory task that was set on Etienne Wenger’s online course Foundations of Communities of Practice that he ran with John Smith and Bron Stuckey in 2008. The task was based on the idea of six degrees of separation. “Six degrees of separation is the idea that all living things and everything else in the world are six or fewer steps away from each other so that a chain of “a friend of a friend” statements can be made to connect any two people in a maximum of six steps” (see Wikipedia). At the start of that course we were given the name of an unknown fellow participant and had to find out enough about them to be able to link to them in six steps and then share this information. This was a very good way of learning more about fellow participants at the start of the course, but also of recognising that we can easily connect to anyone across the world in just a few steps. 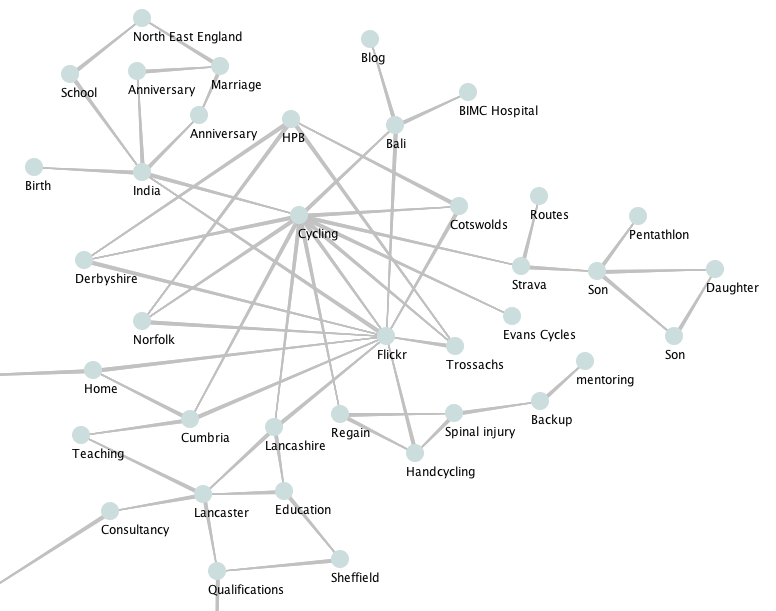 What is the basis for the links in your graph: are they conceptual, physical, causal, historical, aspirational? They seem to be physical and historical, whereas Matthias’s graph seems to emphasise the conceptual. Is your graph unique to you? What would make it unique? What would guarantee uniqueness? I think it must be unique. The nodes are not unique, but the relations between the nodes, whilst they might not be unique individually, as a whole must be unique. I think it would be impossible to guarantee its uniqueness if it remained static. Anyone could come along and copy or mimic it. Uniqueness can only be guaranteed if the graph is continually updating, evolving and new connections are being made. I am not sure whether old connections can be broken, or do they just become inactive and move way off to the edge of the graph? How (if at all) could your graph be physically instantiated? Is there a way for you to share your graph? To link and/or intermingle your graph with other graphs? I’m not sure if I have understood the question correctly? Isn’t the graph I have created using Matthias’s Think Tool, and posted here, a physical instantiation? Does physical instantiation have a specific meaning in relation to graphs? I think I might have missed the point – but I can see that it would be relatively easy to intermingle my graph with Matthias’s graph. 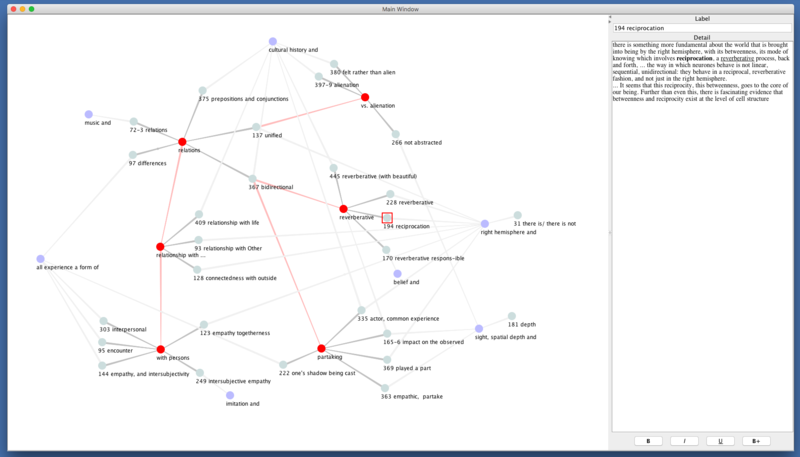 It might be necessary for us both to add a few nodes and links, but not many, to be able to connect the two graphs fairly seamlessly (a bit like the six degrees of separation task described above). What’s the ‘source of truth’ for your graph? This is a big question as it raises the whole question of what we mean by truth. I have been grappling with this for quite a few months now. In my most recent blog post about ‘truth’ – I reported that both Gandhi and Nietzsche have expressed the view that “human beings can only know partial and contingent truths and perspectives; there are a multiplicity of truths and perspectives.” So in these terms, the truth of my graph can only be partial or contingent. Even if I have not knowingly lied, I have selected what to include in the graph and therefore I have also selected what to leave out. But Stephen’s question is about the ‘source of truth’. Is he asking about ‘source of truth’ as defined in information systems? This is not a subject I know anything about. In these terms I’m not sure how to answer Stephen’s question about ‘source of truth’. If someone could enlighten me that would be great. I will start by saying that I do not draw to think, even though I do occasionally draw. I write to think, which is why I am writing this post. Let me explain. The purpose of the symposium is ‘to extend conversations initiated by the AHRC funded ‘Dark Matters’ project which considered the provocations around Thresholds of Imperceptibility’ I attended the Dark Matters workshop at the end of last year and wrote a couple of posts about it. The Materiality of Nothing is a one day symposium at Lancaster University bringing together practice and perspectives on negotiating the absent, unseen and unknown across art, science and social science. Across the arts and sciences that we call ‘zero’, ‘absence’ or ‘nothing’ remains a potent and powerful entity shaping the way we make sense of the world. It is staggering to reflect that 95% of our universe is invisible to human sensing; the provocation of the unknown and unseen is arguably at the core of creative thinking in the arts and sciences. How might mathematics – as a speculative ‘messenger’ to and from the unsensed – be understood as a medium for generating touch and relationship (or not)? For me this resonates with my interest in Absent Presence and also in what Peter Shukie has called the ‘voice of the voiceless’. In other words, how can we give voice to the voiceless and how we can become more aware of the influences of what is not in plain sight? A final paragraph in Sarah’s invitation asks us to …. …. bring along a drawing , notebook or object that could be described as something you think with. The principal editor of Drawing Research Theory Practice Journal published by Intellect has been in touch and is keen to link up this aspect of the symposium with the journal. 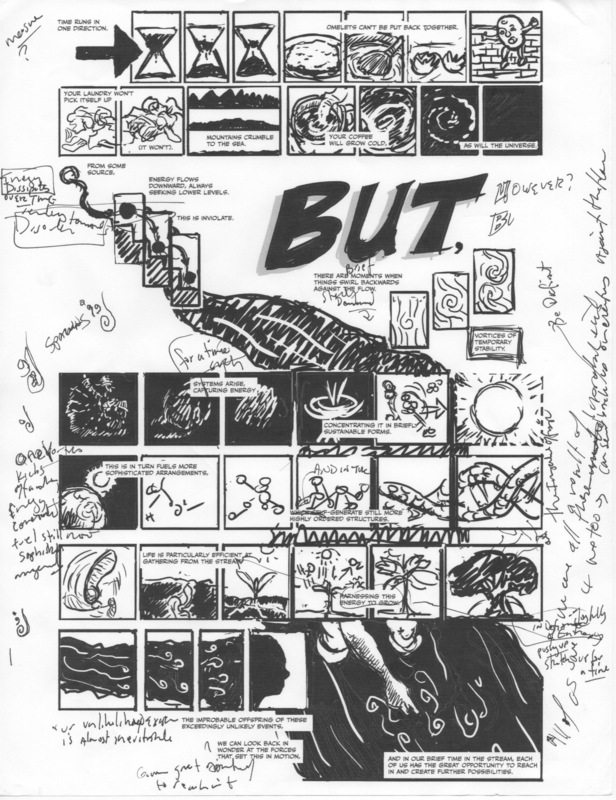 This invitation has highlighted for me that I do not draw to think, although I am interested enough in drawing to know that many people use drawing to think. Here are a few people that come to mind. From the Research Theory Practice Journal website it is clear that the journal is interested in physical drawing as opposed to electronic drawing. 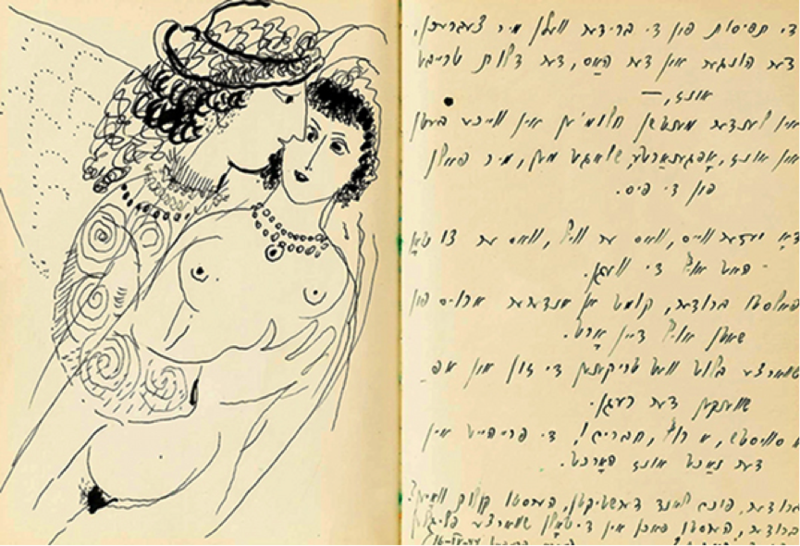 This journal seeks to reestablish the materiality of drawing as a medium at a time when virtual, on-line, and electronic media dominates visuality and communication. This is interesting when artists such as David Hockney are using iPads for drawing. Hockney is on my mind at the moment as I will be going to see his portraits exhibition at the Royal Academy in London in September. 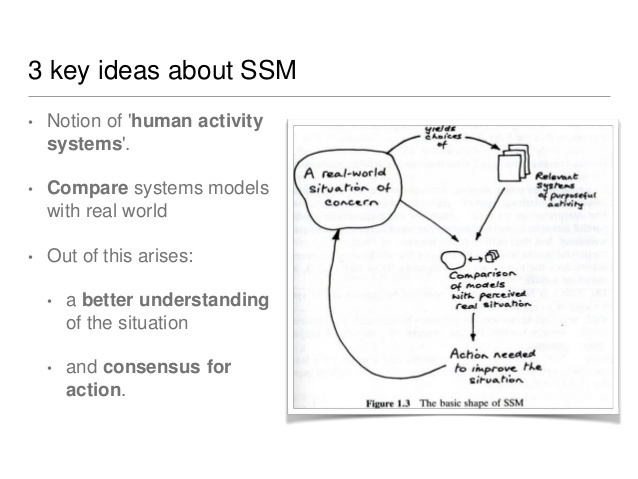 So knowing that I write to think, rather than draw to think, and knowing that the activity for the symposium next week really wants physical drawings rather than ’electronic’ drawings, I am a bit stumped. But I can only do what I can do, so I am taking along the following two examples of drawing/mapping that I do electronically. This example above is how I think about and reflect on any given learning experience. 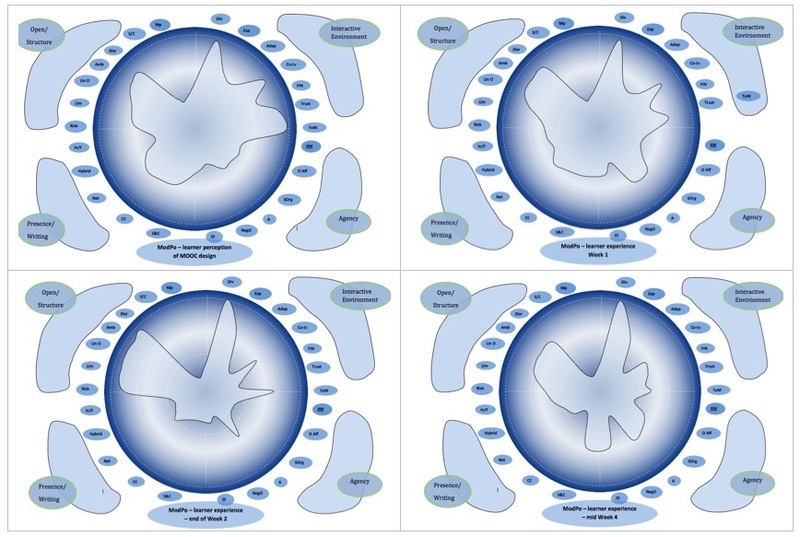 I use the Footprints of Emergence framework which Roy Williams, Simone Gumtau and I developed for trying to understand learning in open learning environments. This has been published as a research paper. The ‘footprints’ above reflect my experience in the Modern and Contemporary American Poetry MOOC and were included in a book chapter that we published in 2015. 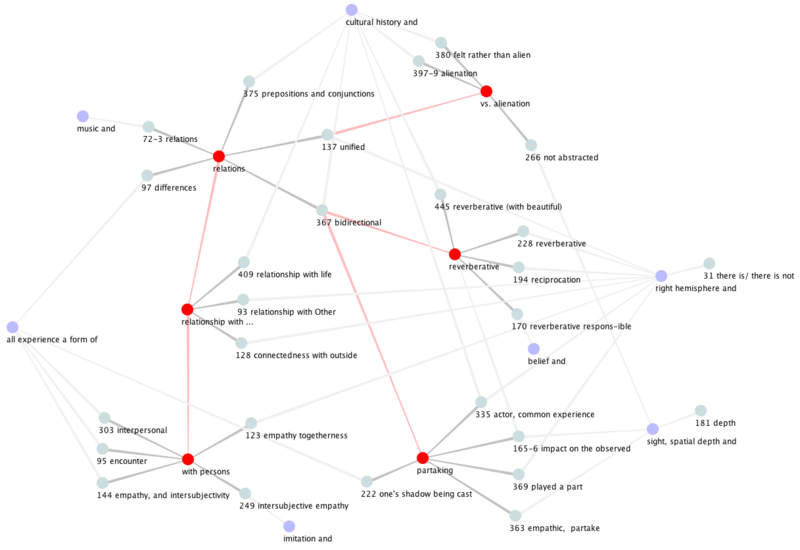 For this I used a mapping tool developed by Matthias Melcher to trace the development of my thinking through my research papers. I blogged about it at the time. I suspect that neither of these is considered examples of drawing to think, but they’re as close as I can get. I am very much looking forward to the symposium next Thursday.